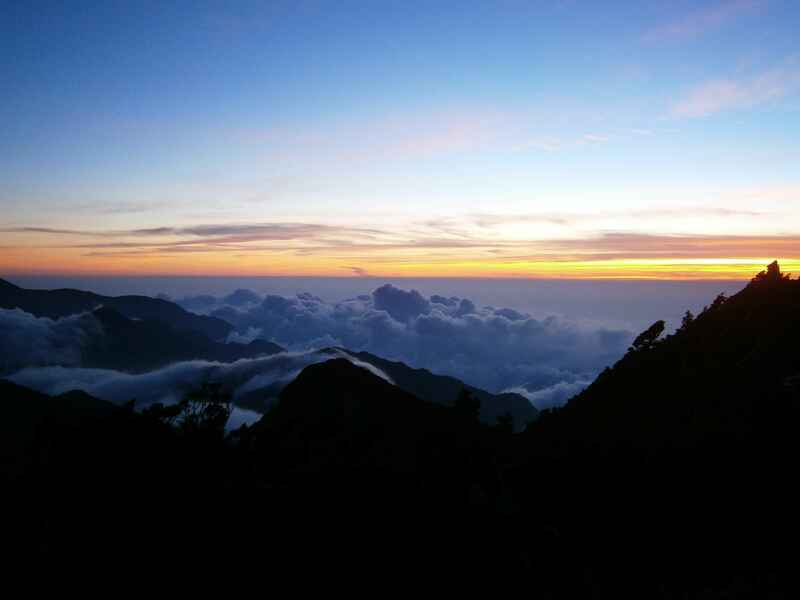 Snow Mountain, with its Main Peak at an elevation of 3886m, is Taiwan’s second highest mountain. 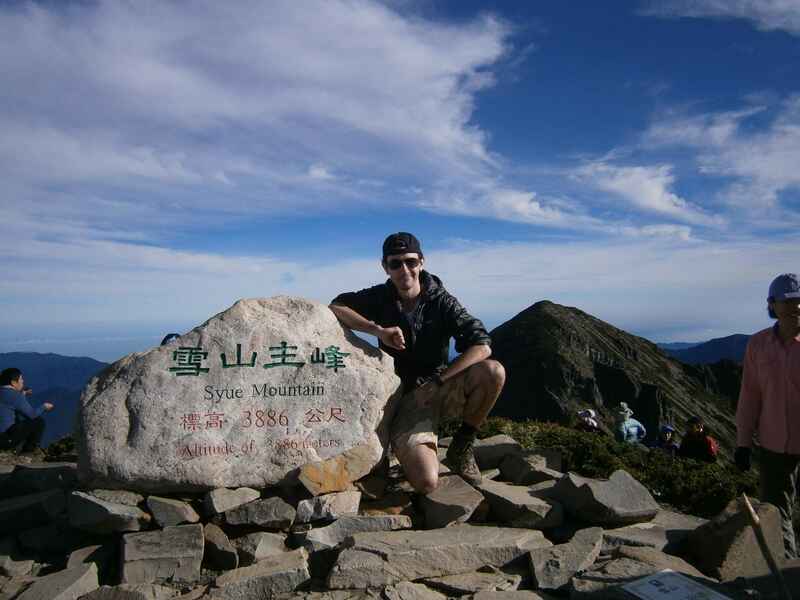 After an exciting climb up the Main Peak in deep snow and inclement weather the past January (Snow Mountain – 雪山 – January 2012), I was eager to return for more hiking. 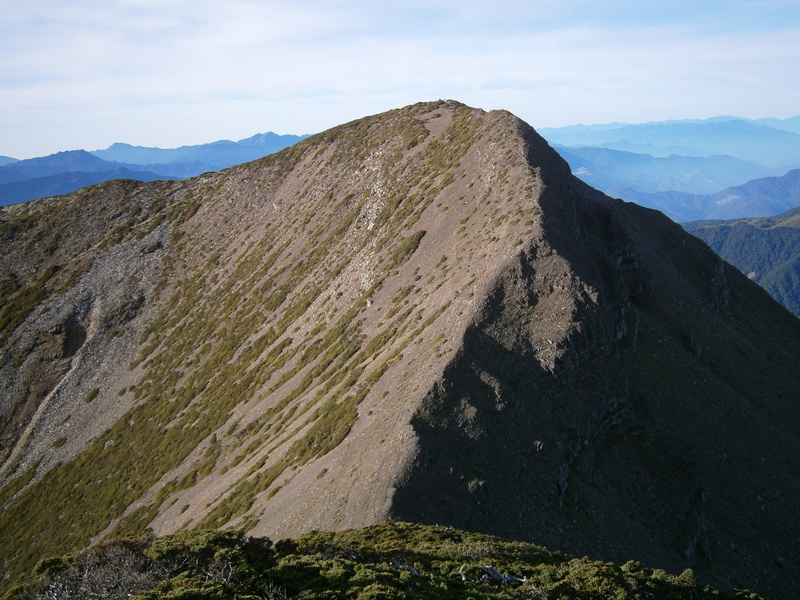 Snow Mountain’s Main Peak, viewed from the north ridge. 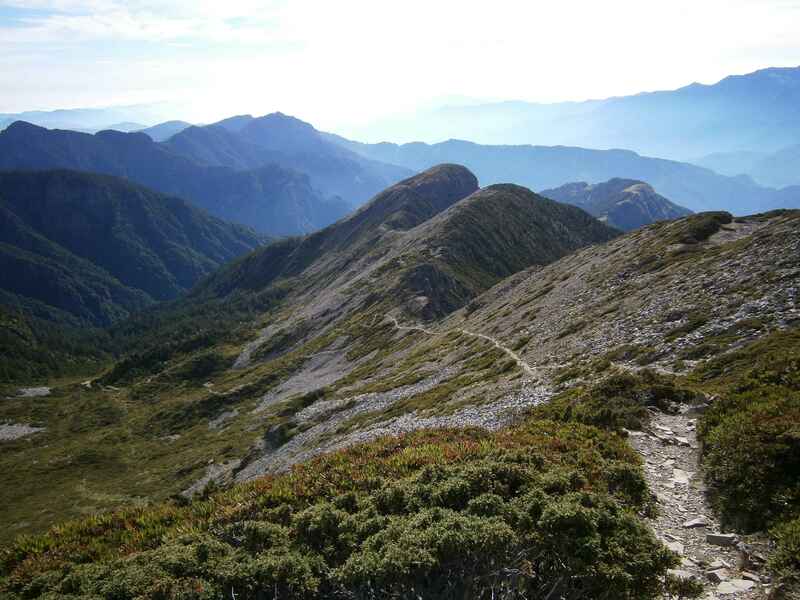 Having already made two winter hikes of the ‘standard’ eastern route up the Main Peak, I decided to take a longer, alternative route up and along the mountain’s ridge-line to visit Snow Mountain’s North Peak, and spend the night camping up on the ridge. My hiking route. 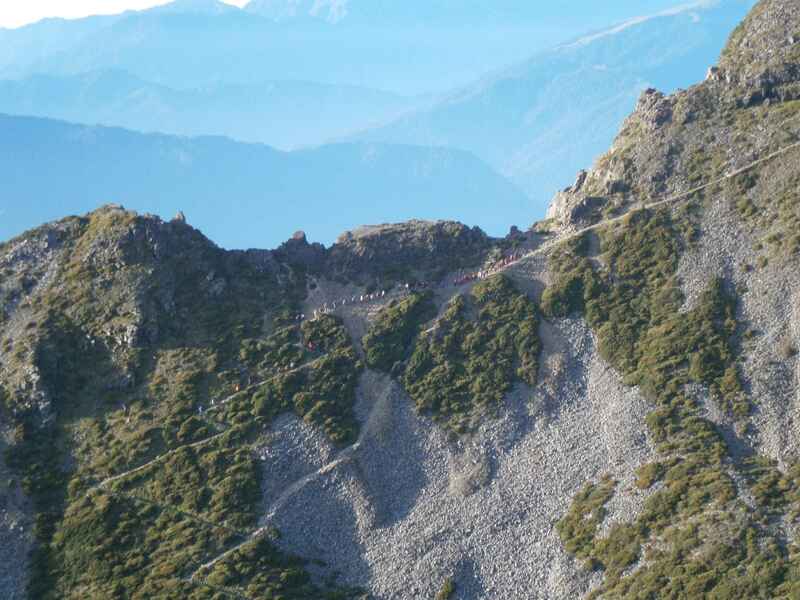 Longer and more strenuous than the traditional Main Peak ascent, but worth it for the experience of hiking the ridge! Day 0: Bus to Yilan, rented a scooter, drove to the eastern trailhead at Wuling Farm. 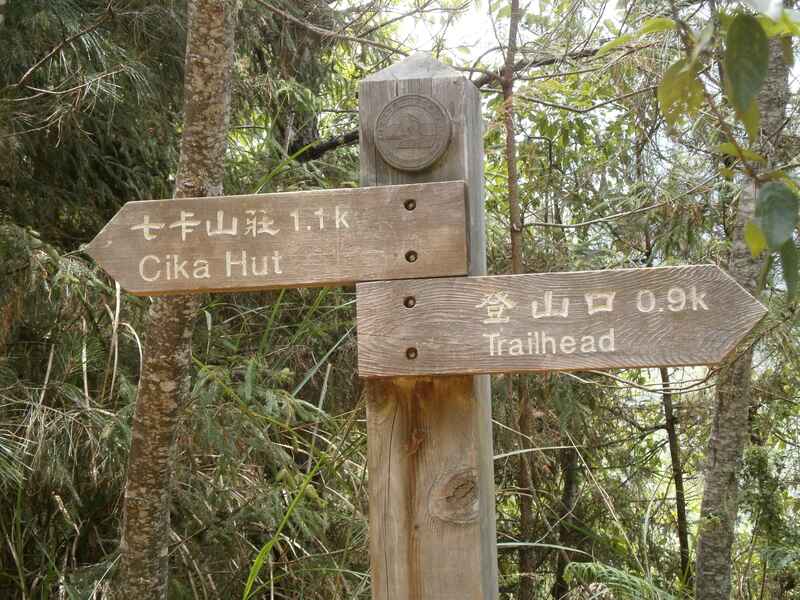 Hiked for ~45 minutes to Chika cabin, arriving quite late. Day 1: Up eary, and hiking by 5:30 a.m. 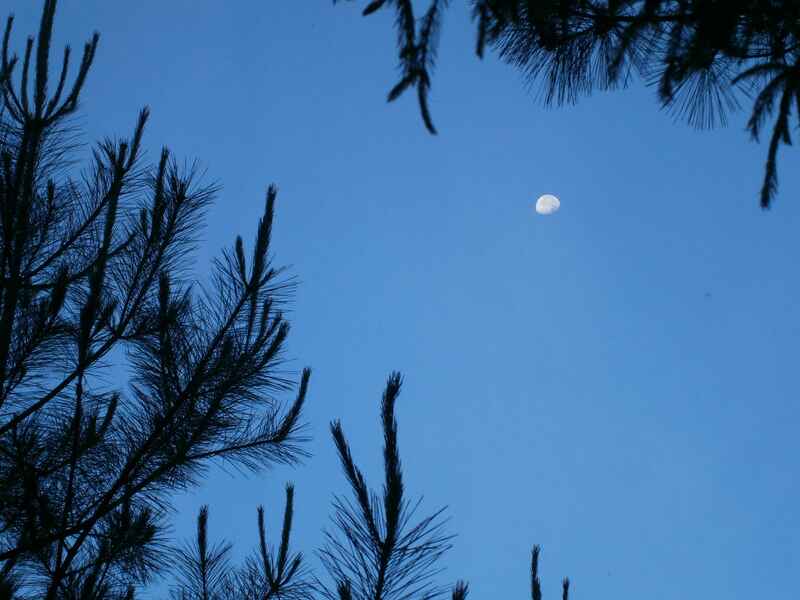 The sky was clear, and the morning moon was bright. As the trail moved higher up a series of switchbacks, the views got better and better. 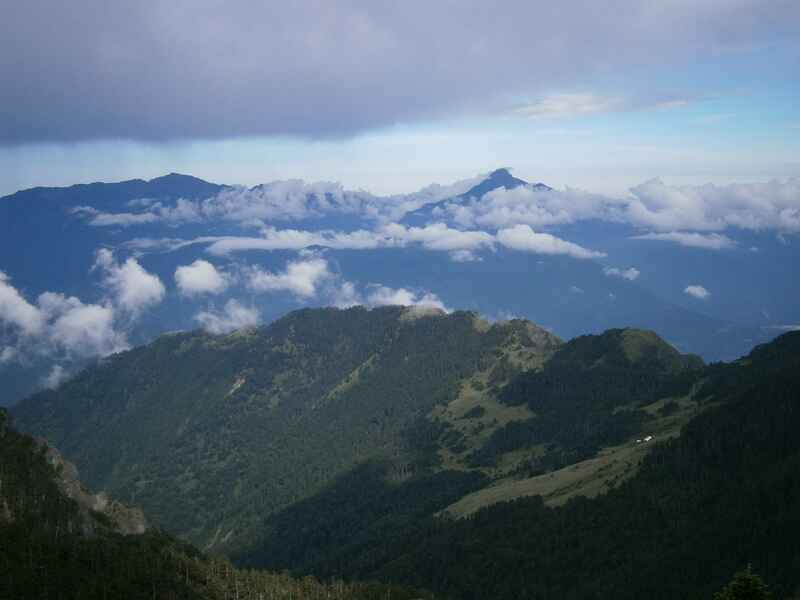 The air was clear, and to the east there was a great view of Nanhuda Shan (left), and Zhongyangjian Shan (right). The weather was fantastic. Blue skies and almost no clouds, but very hot. A far cry from the winter weather I was accustomed to on this trail! The trail looked unfamiliar in the summer weather. 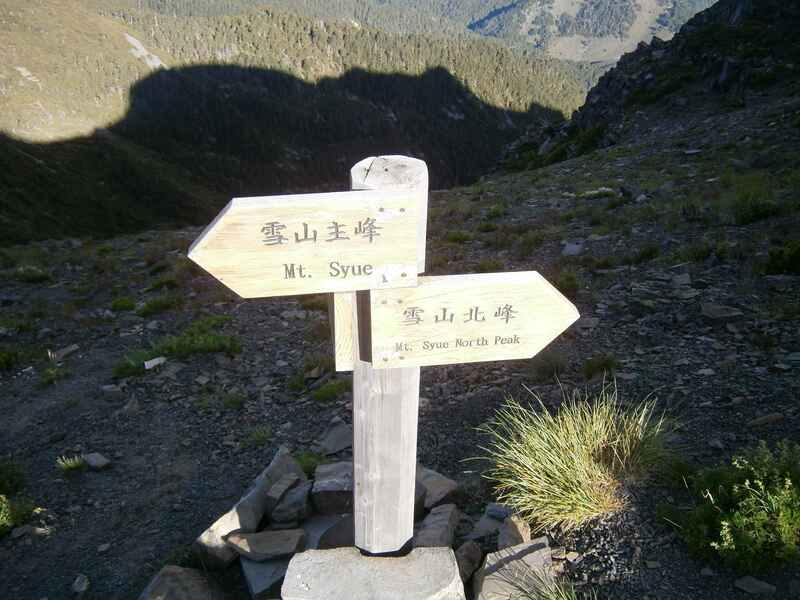 After several hours of hiking, the trail reached Snow Mountain’s East Peak. In the wonderfully clear air both Snow Mountain’s Main Peak and the northern ridge were visible, looming in the distance. 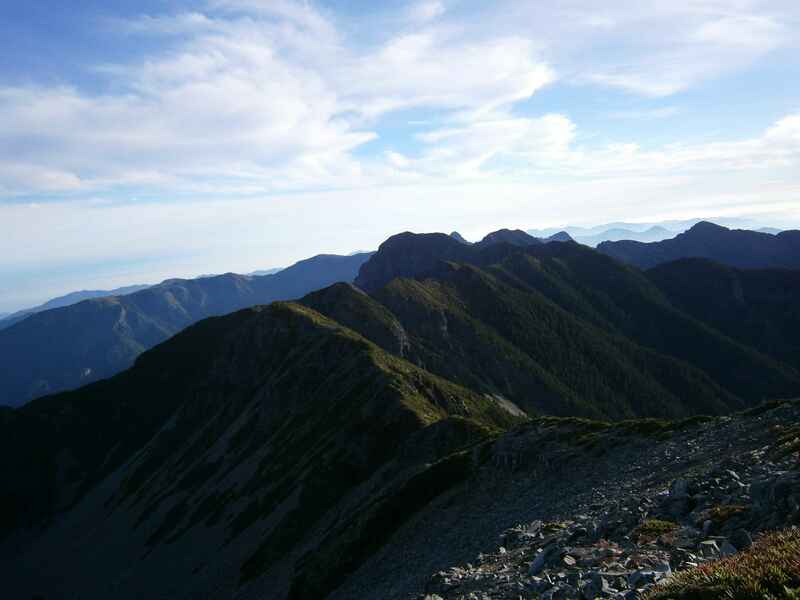 On the East Peak of Snow Mountain, the Main Peak and north ridge in the distance. 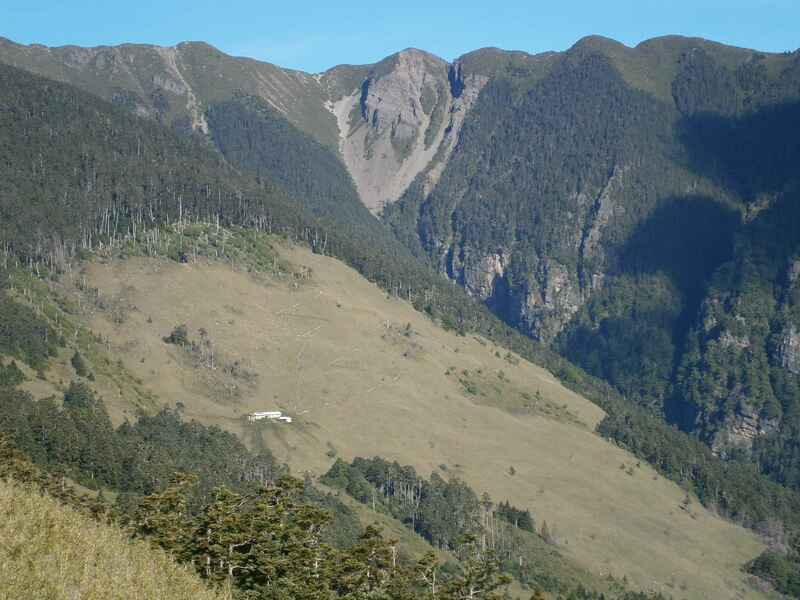 A closer view of Snow Mountain’s Main Peak (far left) and North Shoulder (middle), as seen from the East Peak. 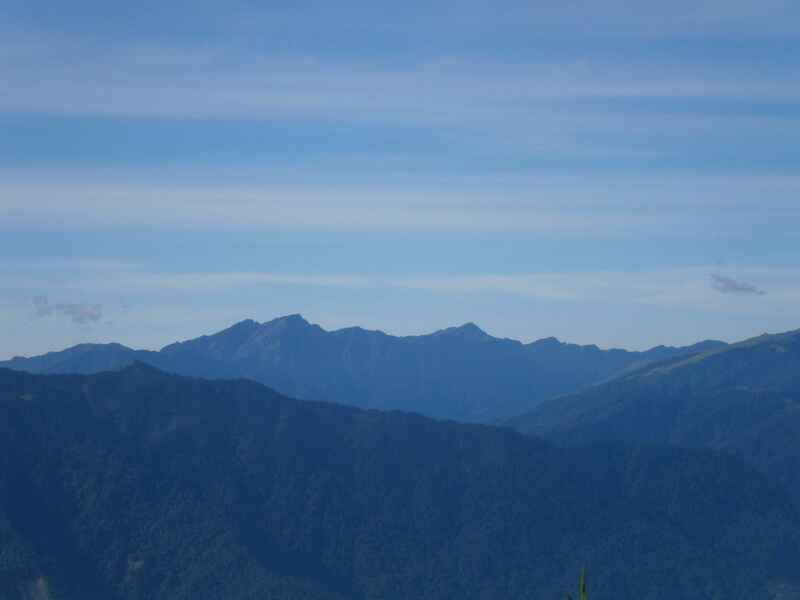 Further away, the Wuling Sixiu ridge could be seen. 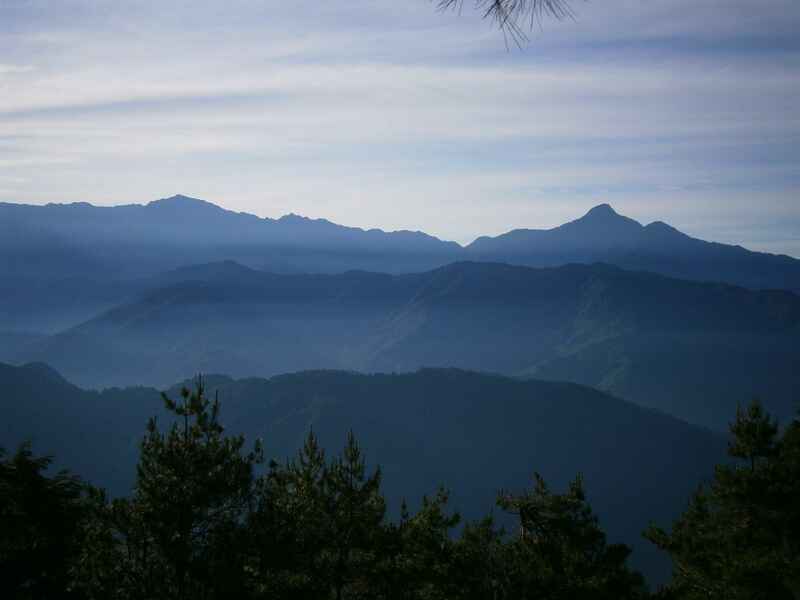 At an even greater distance, Chilai Shan scratched the horizon. The bright, clear sky was truly delightful. 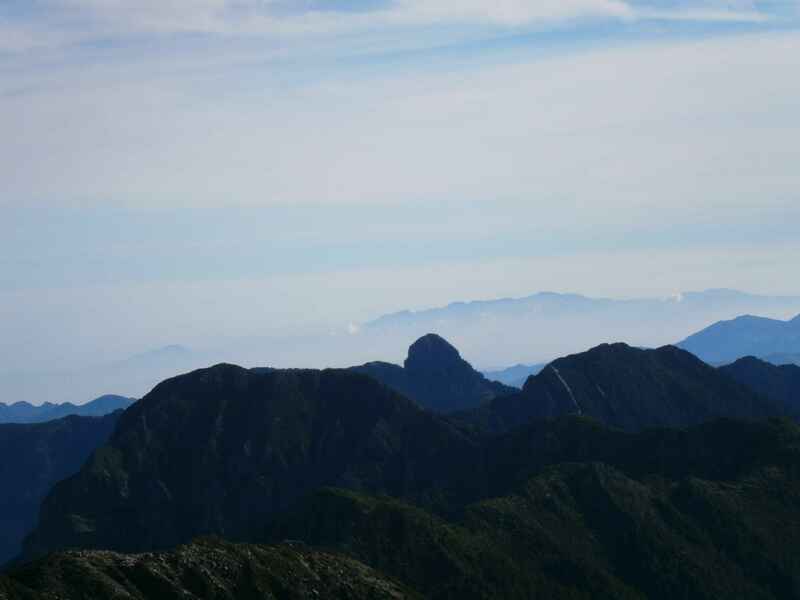 The Sixiu ridge from the eastern Snow Mountain trail: Pintian Shan, Chiyou Shan, and Tao Shan left to right. Chilai North Peak (left), and Main Peak (right) were visible far, far away. Below the East Peak, 369 cabin rested in an alpine meadow, a barren stretch of terrain created by a forest fire. 369 cabin to the west, below the East Peak. I reached 369 cabin at 9:00 and took a good rest. 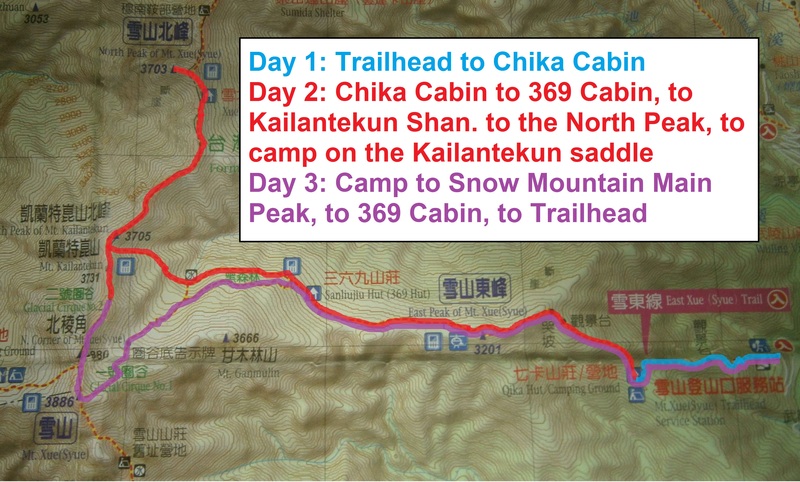 I left 369 cabin at 10:30, heading along a rough forest path and across a stream, towards Kailantekun Shan and the north ridge of Snow Mountain. The forest route looked great in the morning sunshine. 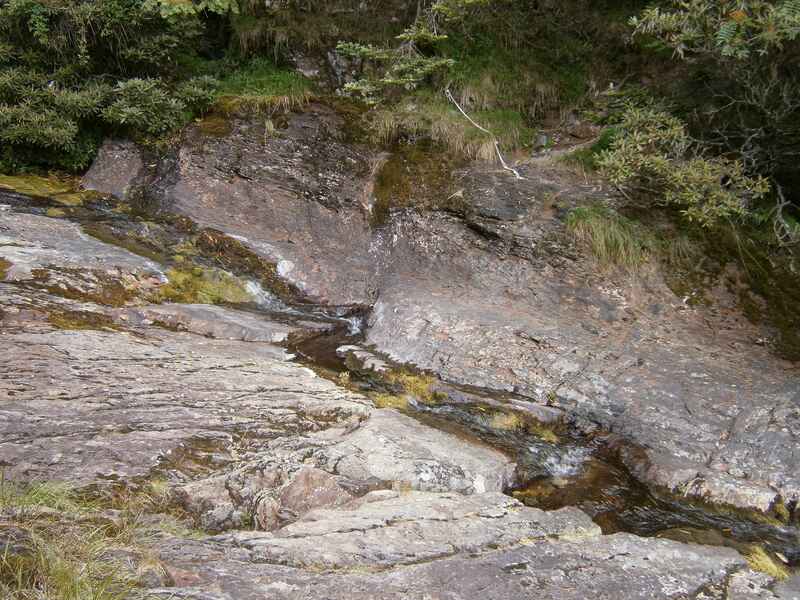 A small stream crossing near the end of the forest. Higher up, the trees began to thin out, and eventually disappeared altogether. As I broke out of the forest, I was greeted by an intimidating sight. 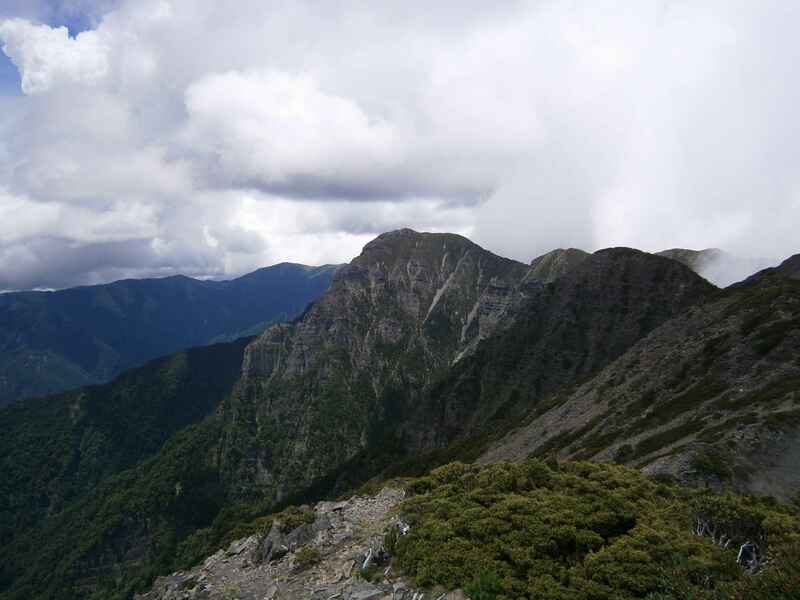 The fearsome cliffs of the northern ridge towered above me, and a steep trail of loose scree led upwards, cutting past the cliff faces and onto the ridge itself. 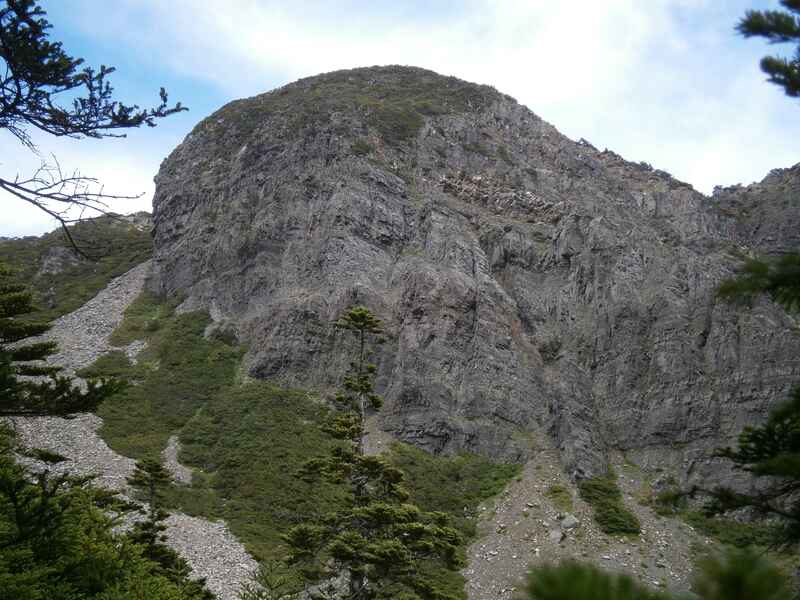 As I ascended above the treeline, this cliff face was my first view of the north ridge. 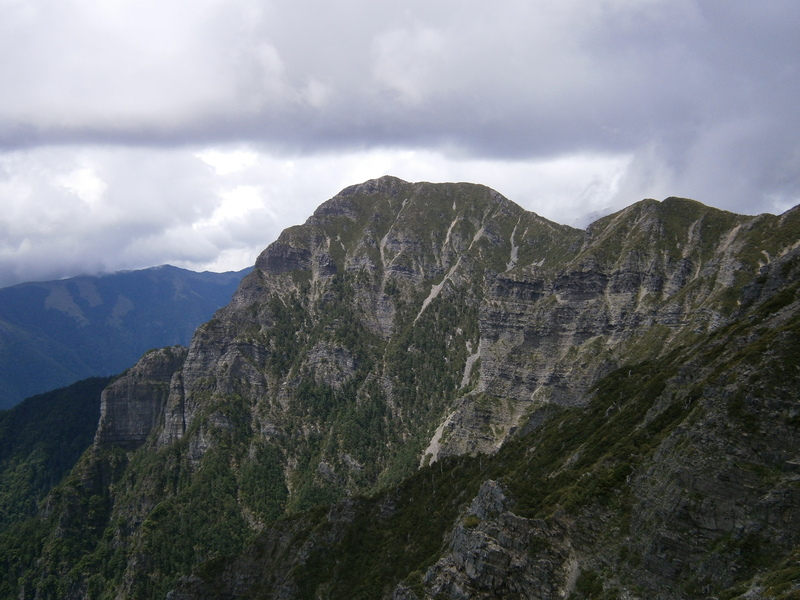 The north ridge is startlingly steep, crowned by vertical cliffs. 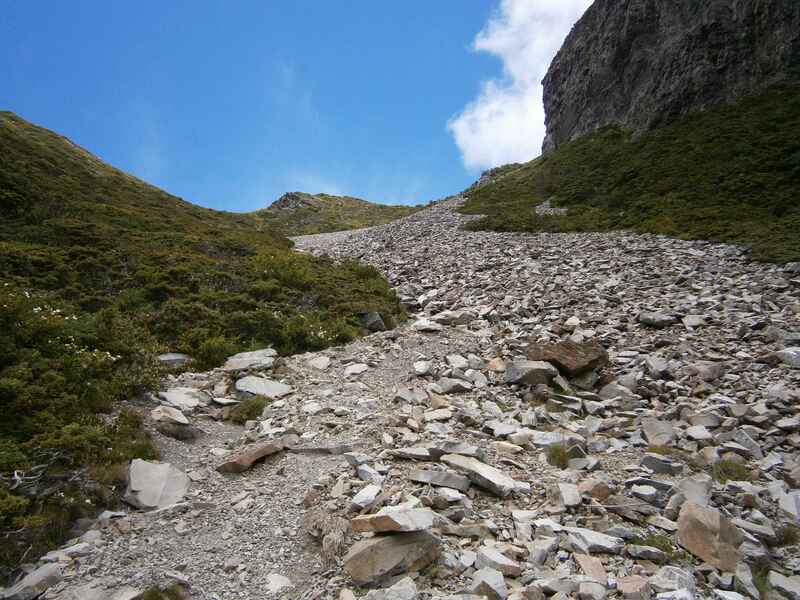 The path upwards was steep, and covered in loose scree. 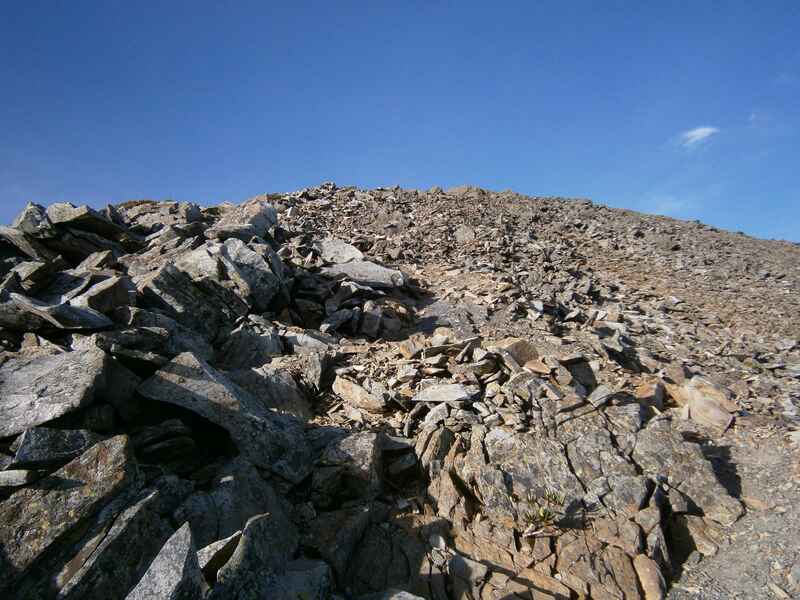 The scree was tiring and unpleasant to climb, especially given my full backpack and large water supply. From the top of the ridge, I had great views of Snow Mountain’s northern ‘2nd’ glacial cirque. 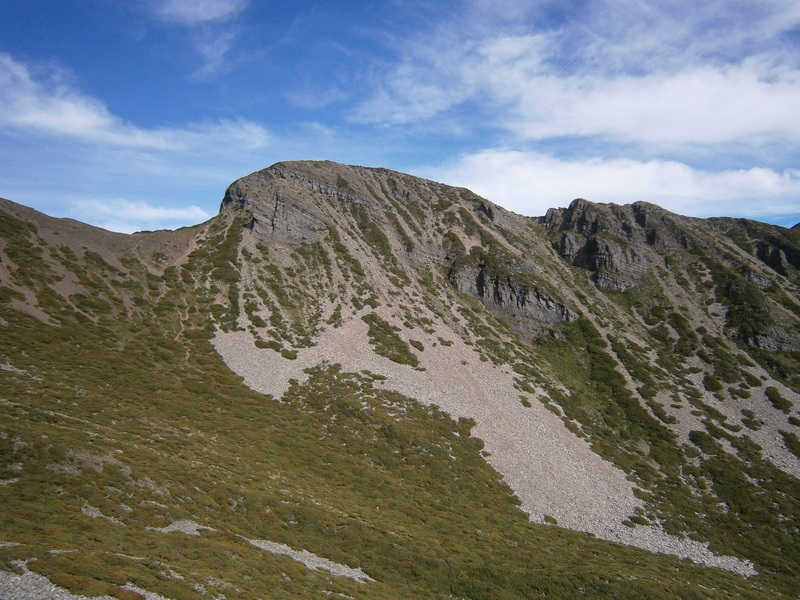 The north, ‘2nd’ glacial cirque of Snow Mountain, located right behind Snow Mountain’s North Shoulder. This bowl-like formation is a remnant of ancient glacial movement. Further along the ridge-line, I could see the North Peak jutting out to the west. 369 cabin and the East Peak looked tiny below me. 369 cabin and the East Peak below. As I moved north along the ridge, the weather began to deteriorate. Huge, dark clouds began to form. Thunder boomed in the distance, and the temperature dropped. Ominous clouds were forming, accompanied by thunder. 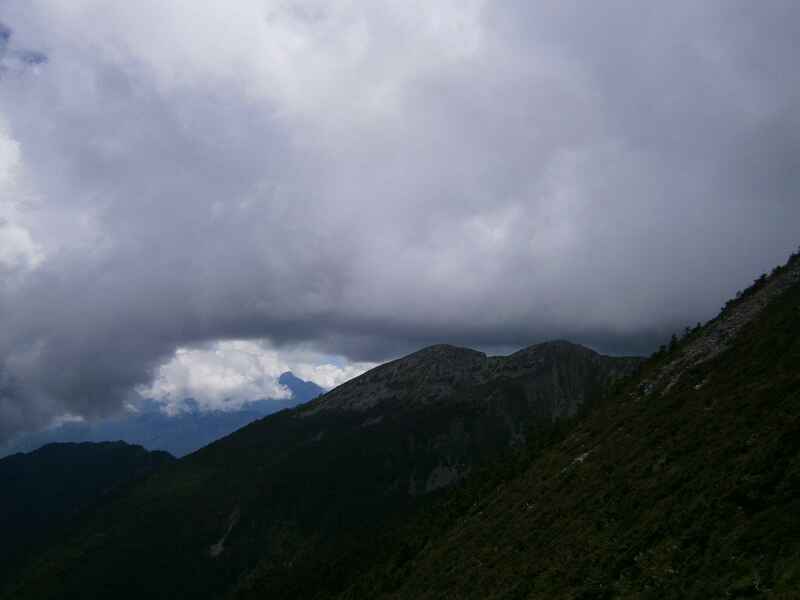 A gap in the clouds revealed blue skies over Zhongyangjian Shan. 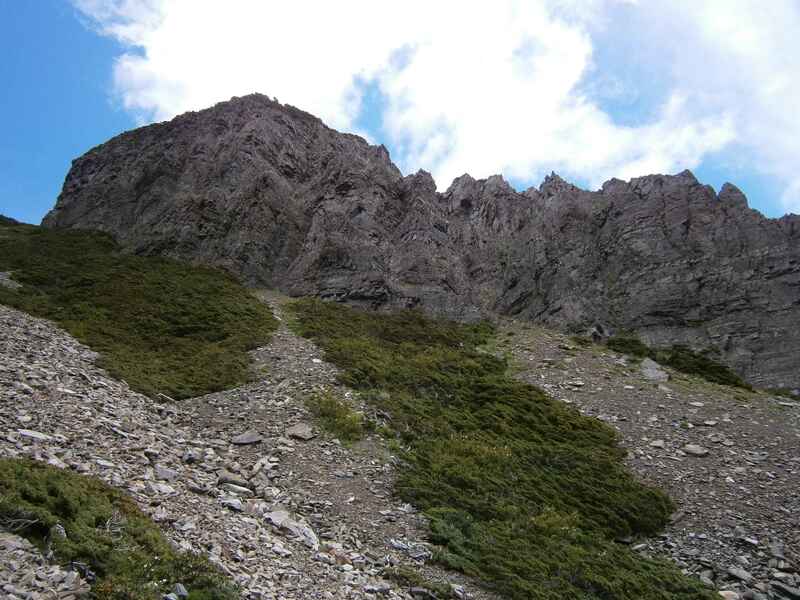 The trail along the ridge wound up and down, alongside vertical cliffs and across rocky slopes. 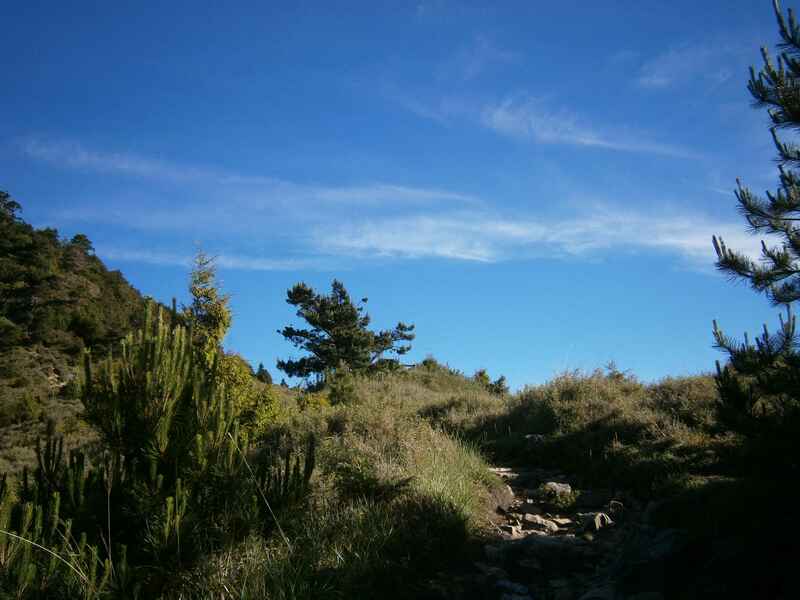 The ridge offered some really exciting and enjoyable hiking! The ridge trail followed the cliffs. To the west, thick clouds billowed up and over the ridge. I was certain that a downpour would begin any minute. The clouds were moving in, and rain seemed imminent. 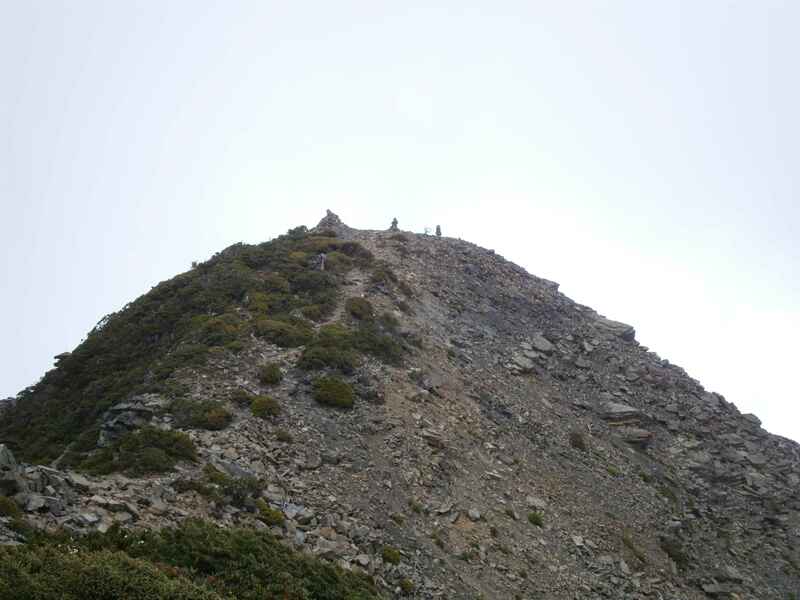 I finally reached the base of the North Peak. Cairns of rock marked the summit. 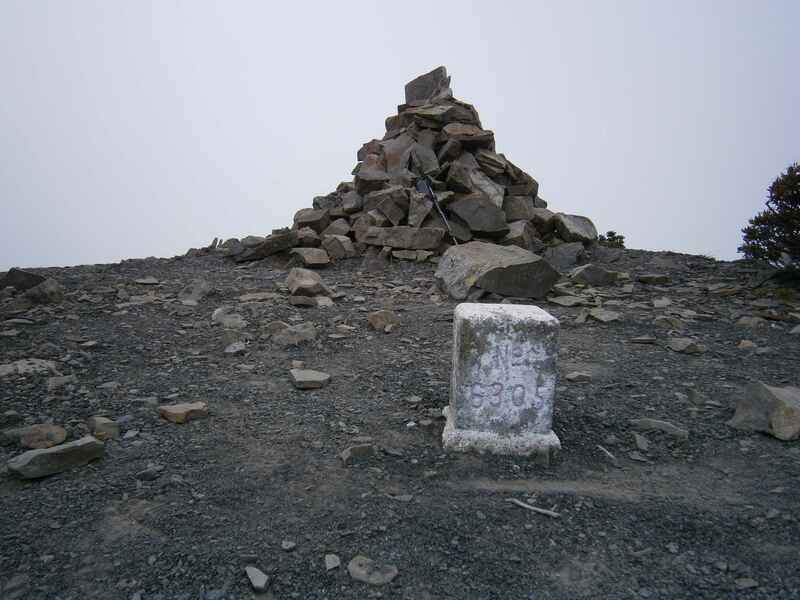 Cairns on the North Peak. The heavy clouds obscured any views from the top. A roughly constructed rock sign sat atop the largest cairn. 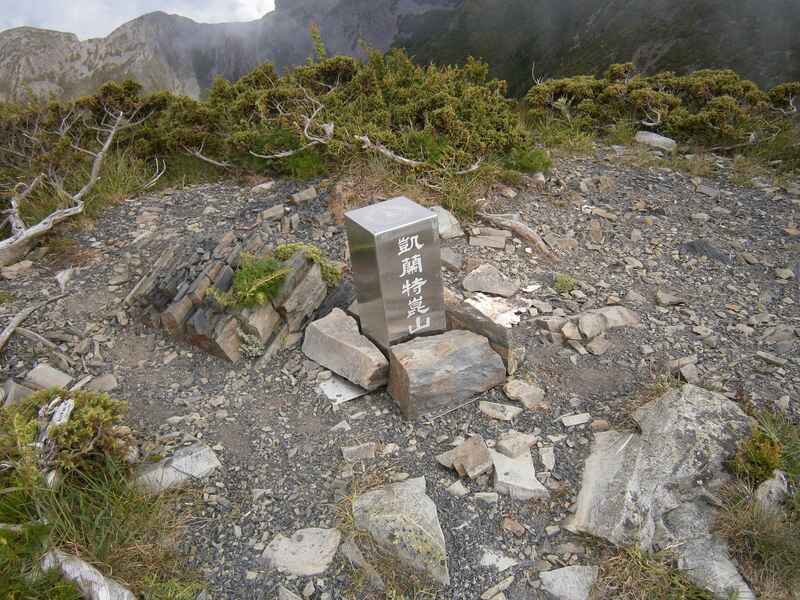 The triangulation marker on top of the North Peak. 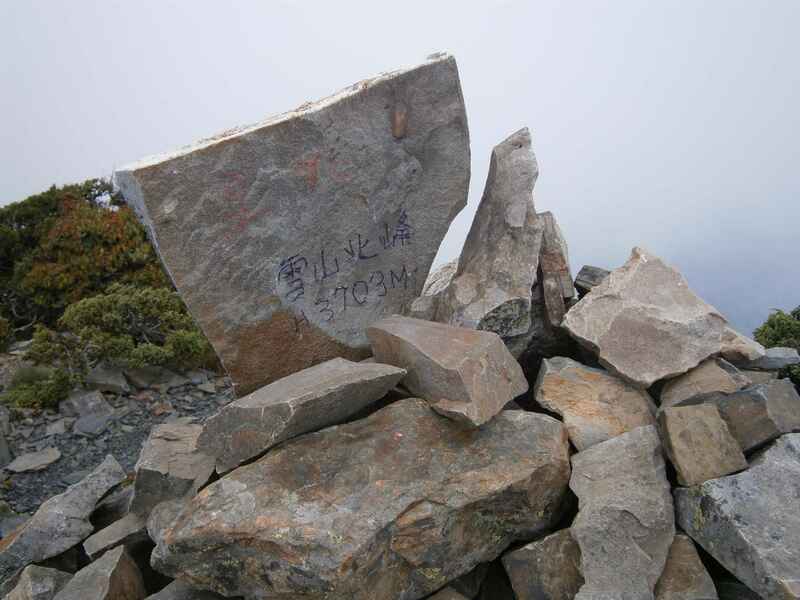 The North Peak summit sign. 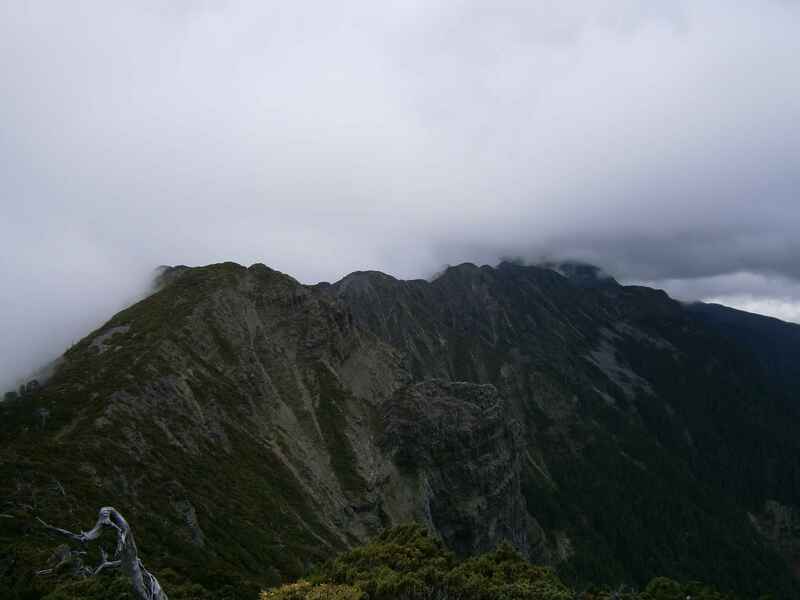 As I returned south, heading towards the Main Peak, the clouds began to clear. I was lucky to avoid rainfall; the ridge is exposed, and any amount of rain would have been uncomfortable. As the storm clouds cleared, the view returned. Here 369 cabin and the eastern trail are framed by Nanhuda Shan and Zhongyangjian Shan. 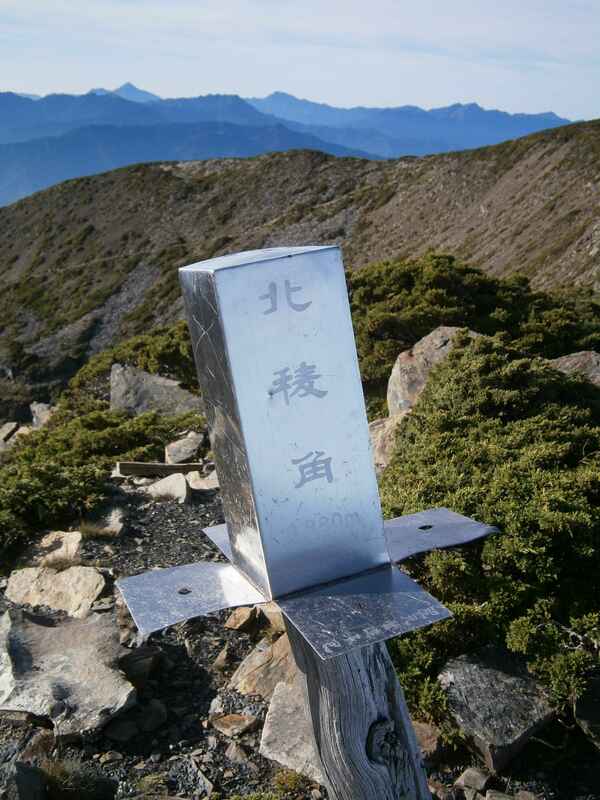 Further south, I passed back over the summit of Kailantekun Shan, marked with a neatly engraved metal post. I reached the Kailantekun Shan saddle at around 5:30 p.m., and upon finding a small area of flat ground, decided to pitch camp. 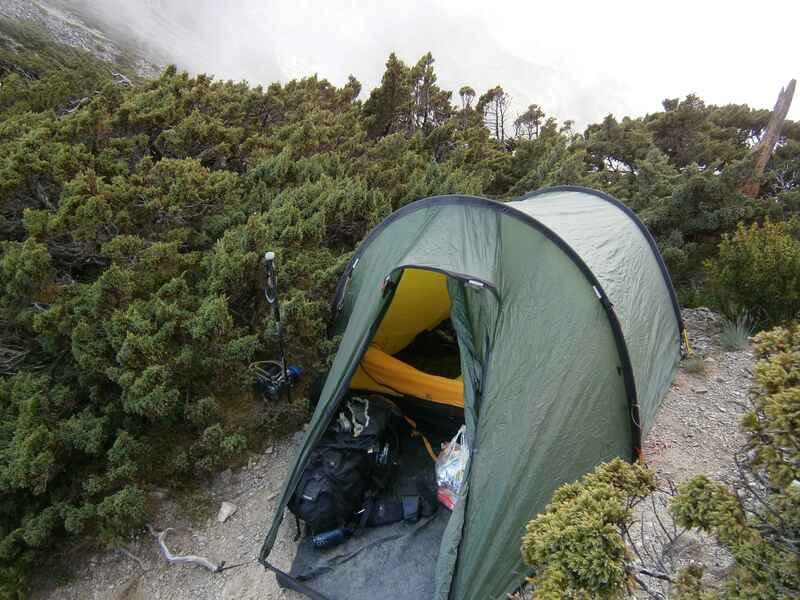 My rough campsite on the ridge. The spot was very tight, and while my vestibule was a little bit crooked, I had just enough flat ground to sleep comfortably. 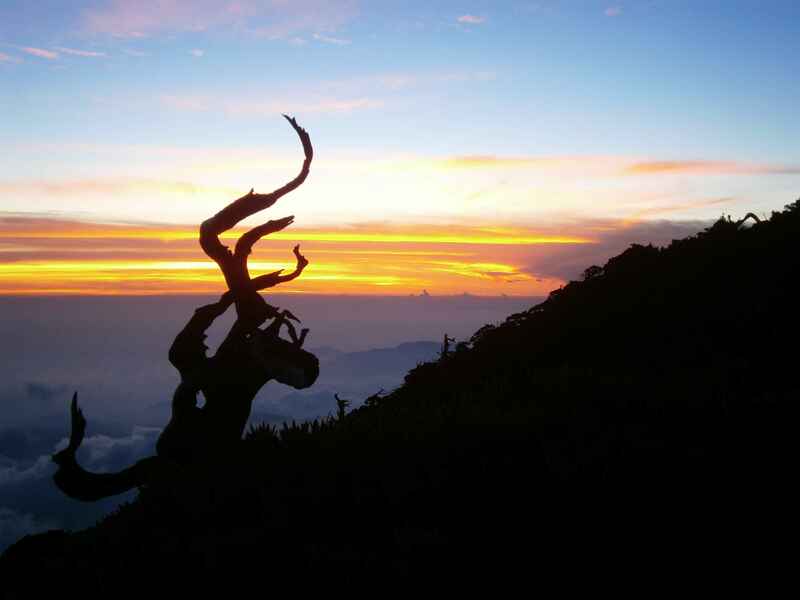 The sun began to set, and I enjoyed a colorful evening sky as I ate dinner in the vestibule of my tent. I had a nice view of the horizon from my tent. The sunset was colorful and very pleasant. After a great night’s sleep, I awoke at 4:15 a.m. The sunrise was unimpressive, and mostly obscured by clouds. I cleaned up my campsite, and continued heading south, towards the Main Peak. Looking back, I could see the winding ridge I’d traveled, the North Peak (far left) prominent. Looking back at the north ridge. 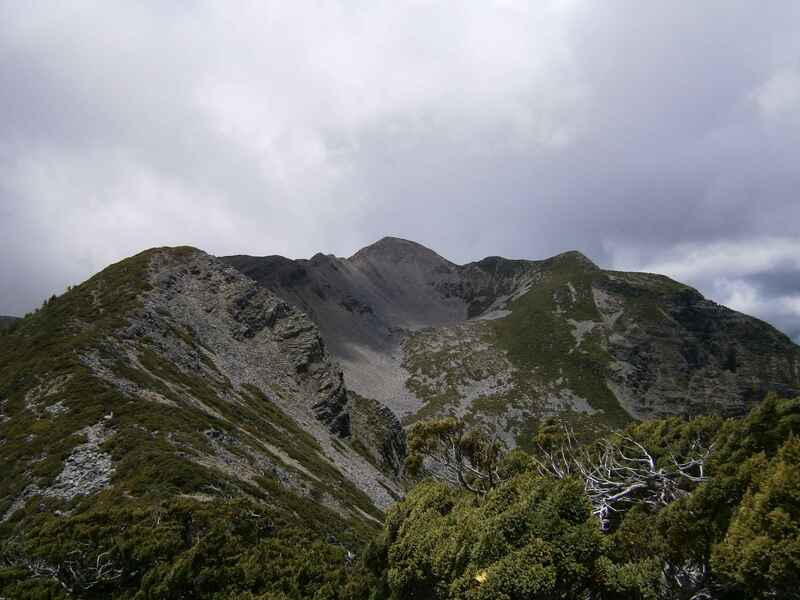 At the base of Snow Mountain’s North Shoulder, more scree awaited me. Scree is remarkably annoying to ascend. More scree on the way up Snow Mountain’s North Shoulder. The top of the North Shoulder was marked with another neatly engraved post. 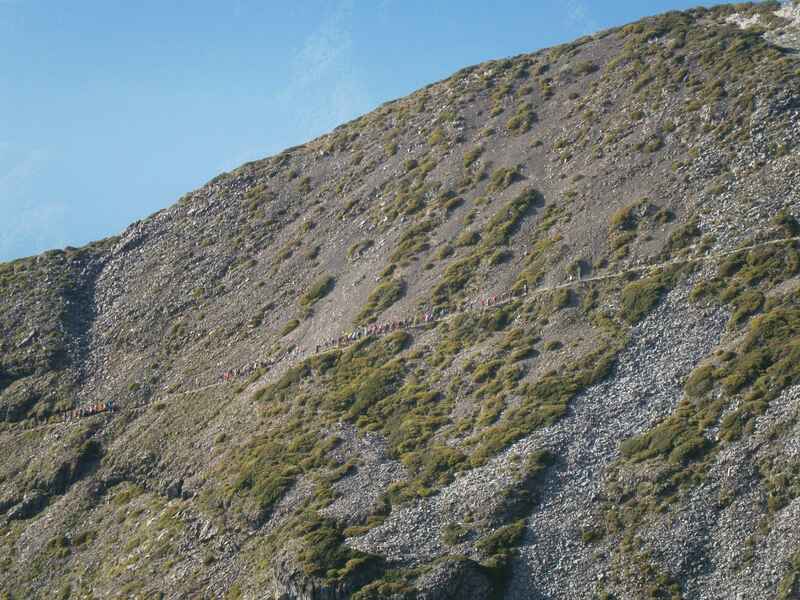 Below, I could see huge groups of hikers headed up the ‘standard’ eastern route towards Snow Mountain’s Main Peak. The top of the North Shoulder. Below me, big groups of hikers were headed up the eastern trail to the Main Peak. Watching the crowd below, I was happy to be approaching the Main Peak from the north, to this point with the trail all to myself. 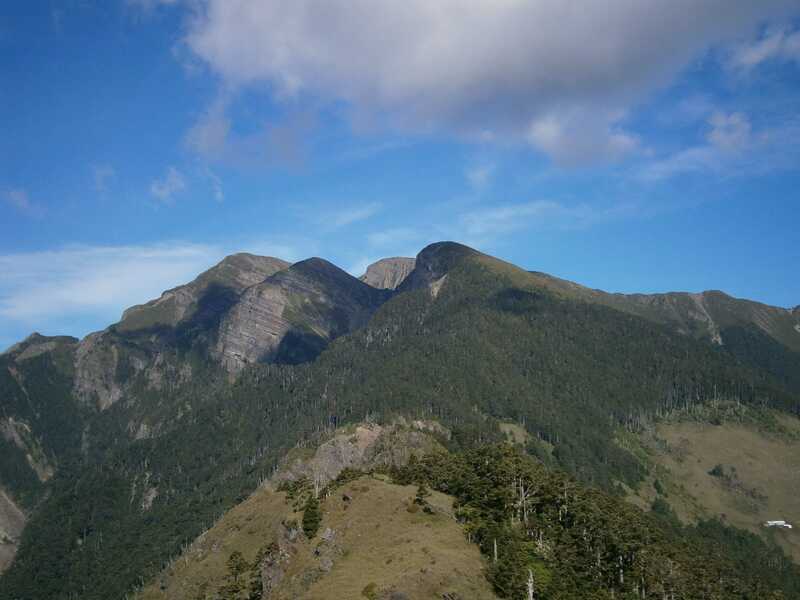 From the top of the North Shoulder, a steep descent took me to a saddle between the Main Peak and North Shoulder. The North Shoulder cast an interesting shadow past the saddle. Looking back, the North Shoulder’s cliff was an impressive sight. The route down towards the Main Peak curves past the sheer drops. Looking back at the North Shoulder’s sharp face. 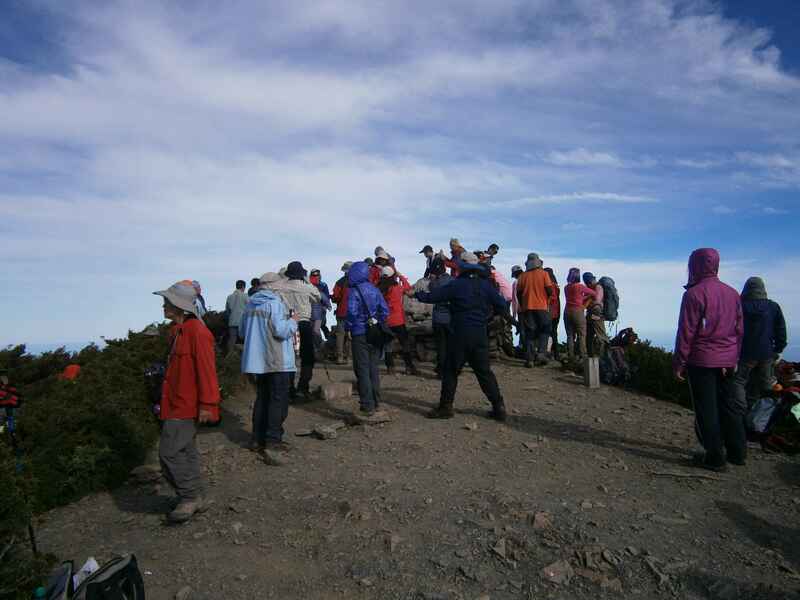 The Main Peak was crowded with other hikers. It was a strange sight, given I’d been completely alone with the trail all to myself since passing 369 cabin the previous day. The Main Peak was very crowded, and I had to line up to take a photo with the summit rock. On top of the Main Peak. 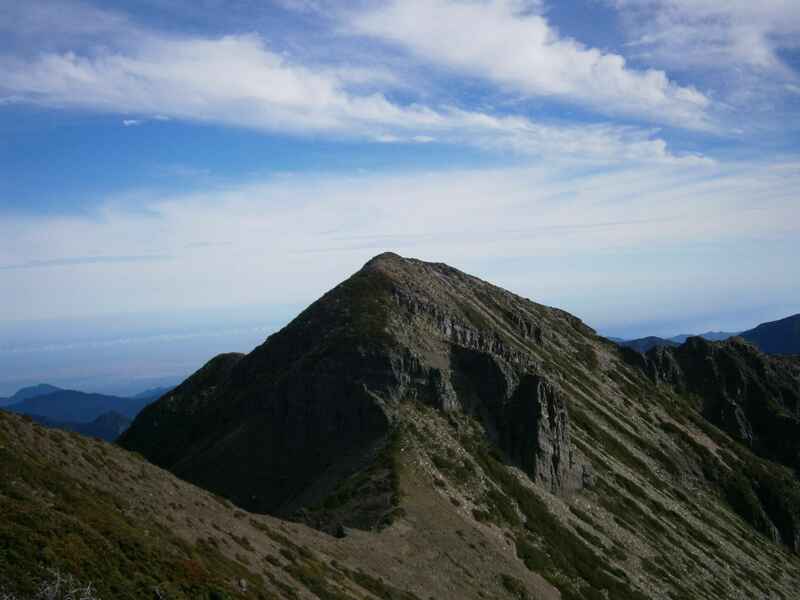 From the Main Peak, I had a great view of Dabajian Shan. 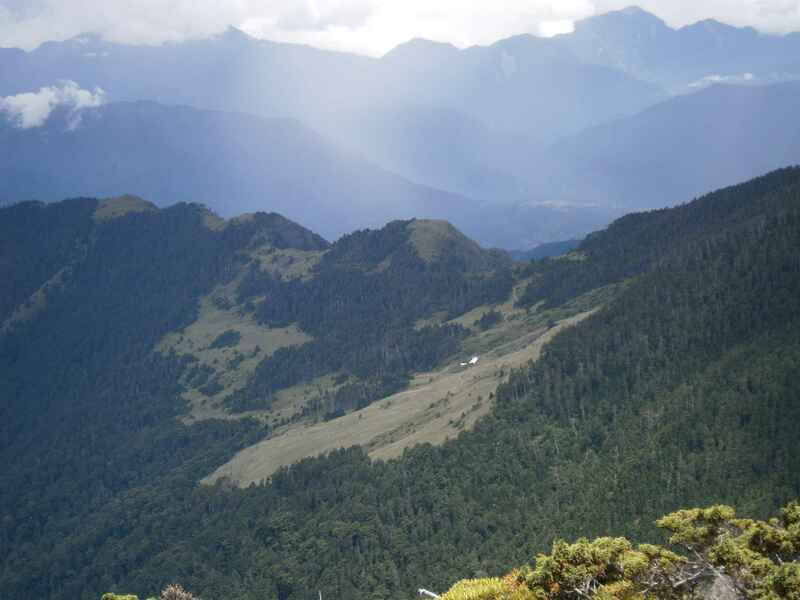 Dabajian Shan, with the North Peak in front of it, from the Main Peak. In the summer weather, the route down from the Main Peak was much different than the icy, snow-drift covered face I had experienced on previous Snow Mountain hikes. 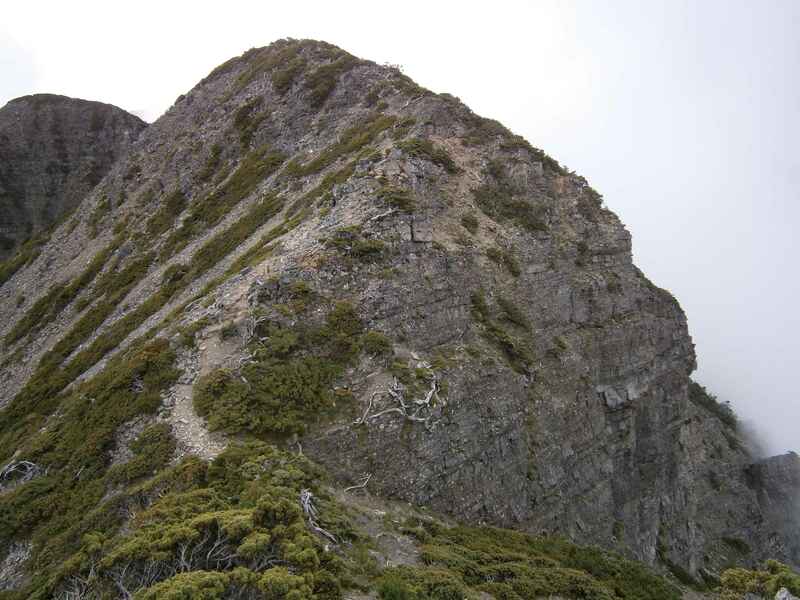 The eastern Main Peak trail, my descent route. Behind me the North Shoulder looked impressive on the way down. The North Shoulder, viewed from the eastern trail. 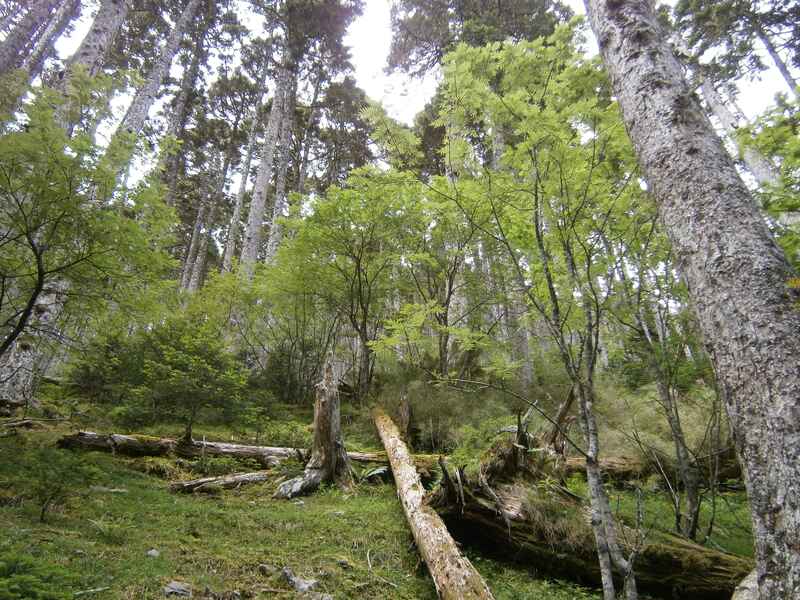 Further down, I returned to the evergreen forest. It was vibrant in the morning light. 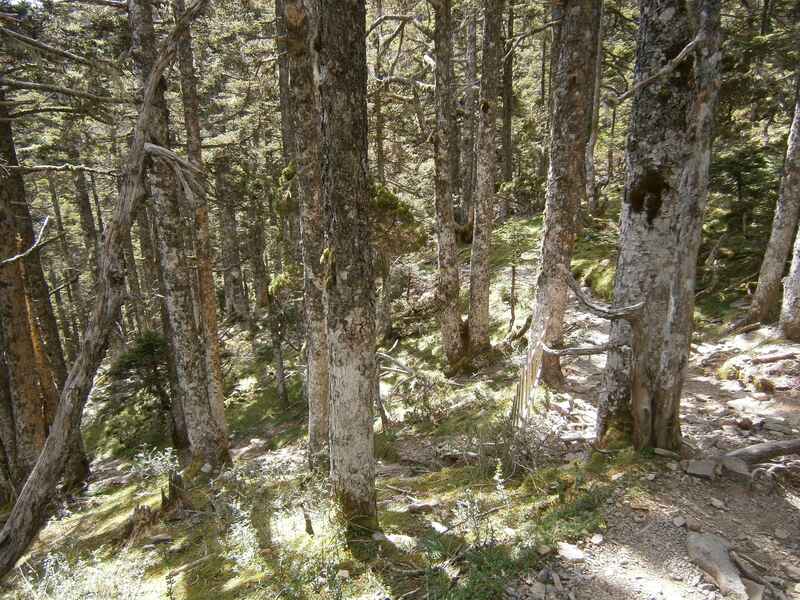 I descended back through the forest, enjoying sunshine through the trees. An opening in the trees, glowing with sunshine, marked the end of the forest. 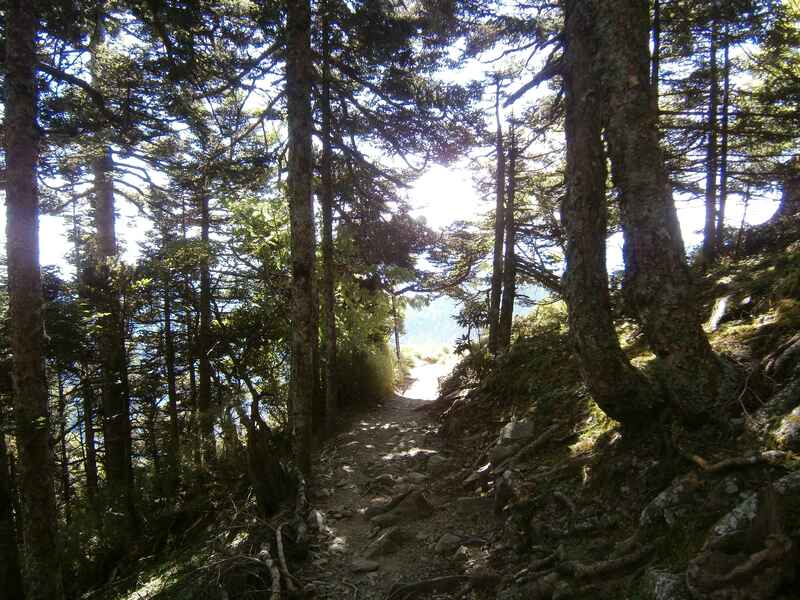 From 369 cabin to the trailhead, the hiking was uneventful but pleasant. The weather was hot and sunny, but not the slightest bit humid, and so quite comfortable. One final signpost near the end of the trail. I reached the trail head at 12:30 p.m., had a snack, packed up my gear, changed my clothing, and drove my rental bike back to Yilan. This had been a fantastic hike, and I left feeling grateful to once again have had great luck with weather. Camping on the ridge was exciting and beautiful, and the strenuous first day (most notably that short burst up the north ridge’s scree slope) had paid off through great views and enjoyable hiking terrain. 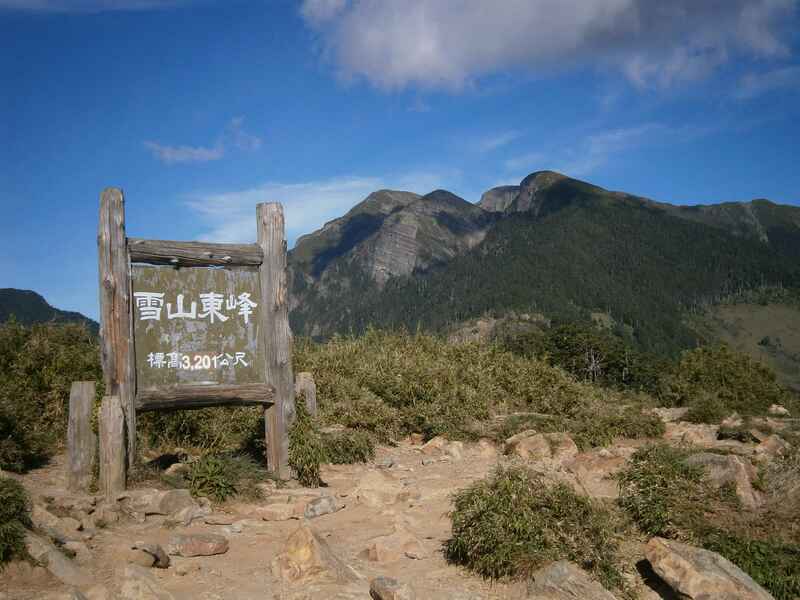 Wuling Farm, where the trailhead is located, is fairly easy to access. I drove in via rental motorbike from Yilan. You need a Taiwanese driver’s license to rent. 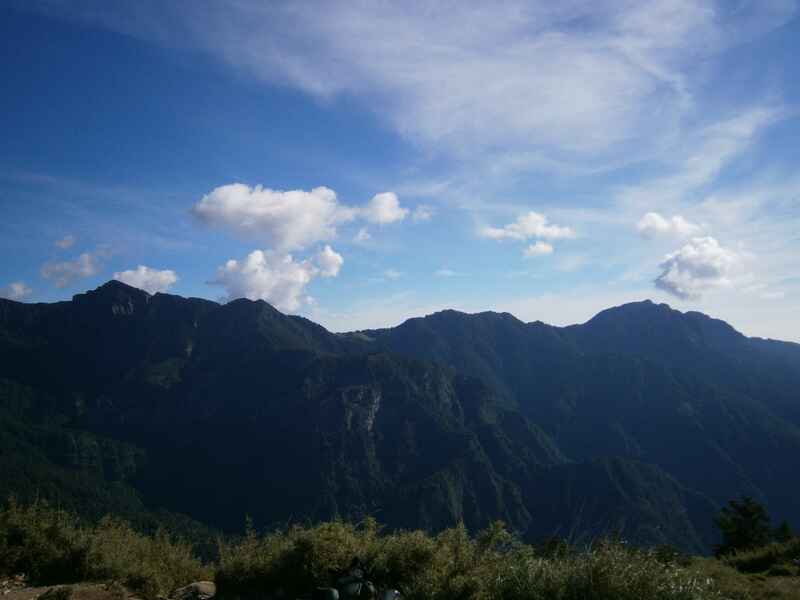 This entry was posted in Hiking, Shei-Pa National Park (Snow Mountain) - 雪霸國家公園, Taiwan - 台灣 and tagged 雪山, 雪山北峰, Hiking Taiwan, Snow Mountain, Syue Shan by Ian. Bookmark the permalink.